Todd Pagano, associate professor and director of Laboratory Science Technology in the National Technical Institute for the Deaf and the 2012 U.S. 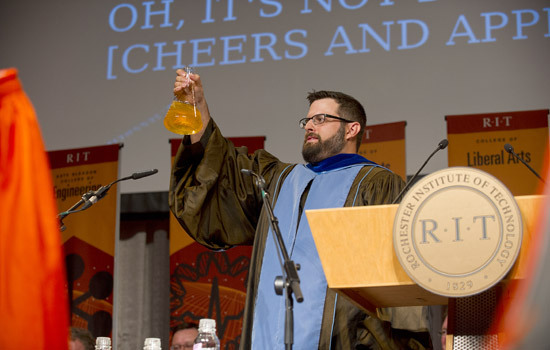 Professor of the Year, delivered the keynote address—complete with a chemistry experiment—during Fall Convocation on Wednesday. RIT officially kicked off the school year on Wednesday with convocation. Todd Pagano, associate professor and director of Laboratory Science Technology in the National Technical Institute for the Deaf and the 2012 U.S. Professor of the Year, delivered the keynote address. Student Government President Paul Darragh, a third-year software engineering major, also spoke. The text of Pagano’s speech is below. “Students, parents, faculty and distinguished guests—please allow me to add my words of welcome to RIT. I am going to attempt to do some actual chemistry for you today, so I will turn over the signing to the skilled interpreters from here. “Students…you and I can relate. And parents, I am certainly not overlooking the significance of your attendance here today, but if I may, I would like to tailor my words directly to your students. Students: I can relate to each and every one of you. If on no other level, I once sat where you do today. And truthfully, I do not recall the message of the convocation speaker on that day…and frankly, when I am done, you might not either. But I am certain that on that day years ago, I couldn’t have remotely considered the things that I have experienced in my career…even in this past year—being named a Fellow of the American Chemical Society, receiving the U.S. Professor of the Year honor, or going to Capitol Hill to spread the word about deaf/hard-of-hearing learners to members of Congress. I can assure you that these things were nowhere on my radar when I sat where you all sit today. “The point that I am trying to elucidate, and I know that it is cliché, is that college opens doors…opportunities that you likely are not even imagining today. I am absolutely convinced of that. But I am also convinced that your success will require some work on your part. “In an attempt to give my message today a fighting chance to be remembered, I would like to talk about chemistry (despite what a contradictory statement that might be… “keep your attention and talk about chemistry”). And just because I am using a chemistry analogy, it doesn’t mean that students in non-science majors can tune out. So, please just stay with me for a minute. “Getting the focus back on me after a class demonstration is always hard, and I have found that trying to compete with the wonders of science is ultimately futile. But if I can win back your attention for a moment as I attempt to parallel this demonstration to the college paths that you all have in front of you. “What would I like you to take-home from this demonstration? Well, there is an inevitable activation barrier standing between where you are right now and ultimately the great things that you will be able to do during and after your time at RIT. I urge you—I plead with you—to put in the energy to overcome this barrier. The process of overcoming the activation barrier is a critical component of the shared-mission of student success. I throw that term around all the time, the shared-mission of student success, because for my money, it’s the best way to learn. You see, the successful outcome of your education is not as dependent on your professors as you might think (though their role, of course, is also critical). No, it is a shared mission between you (most importantly you), your classmates, and the faculty/staff of RIT. If you do not put in that extra activation energy, then you are not fully adding your part to the shared-mission, and you risk missing a reaction…an opportunity that could change your life. Life changing accomplishments happen to students here at RIT all the time. Your work can be included in scholarly publications, you can receive awards and scholarships, you can travel the world making presentations at symposia, and you can find great co-ops that can lead to successful careers. “But here’s an example of falling short of the activation barrier: Say you go to class, listen to the instructor, go back to your room, maybe complete some of the assignments, and perpetually do the same thing for the remainder of the semester. In such a case, you might not have completely failed, but the reaction pathway toward the shared-mission of your ultimate educational success likely hasn’t overcome the activation barrier standing in the way of taking your educational experience to the next level. So, where do you find this extra energy or catalyst? Well, it’s likely not created by spending more time on social media outlets (though that might be an unfair jab for a non-Facebook user such as myself). But it is also not found while obsessing over a fantasy football trade (something for which I am guilty). And don’t sit back: lean in and find your place at RIT, and then, in the world. “You are all here because you have felt the “fit.” Something intrigued you enough, challenged you enough, engaged you enough to make RIT your college of choice. And, by all means, you made a great choice. You have already brought with you the intelligence, curiosity and academic preparation required to succeed. Now that you are here, use those tools toward your studies, but find your catalyst and overcome the activation barrier standing between you and great things in your future. Reach out, connect, and collaborate with faculty and staff—link minds with them inside and outside of the classroom, share thoughts…share the mission of your educational success! “So, welcome, students, to RIT. In fact, welcome to your own new “experiment.” Good luck. Work hard. Have fun. And please, be that catalyst unto yourselves… and find your own activation energy that will make great things happen for you at RIT and beyond.